“The best way to find yourself is to lose yourself in the service of others” [Mahatma Gandhi]. Over 40 volunteers knew this to be true on December 12th and 13th as they gave their time, support and muscles to hardworking families at the Cornerstone Foundation’s Christmas Store. Over 40 volunteers went out and purchased groceries, toys and iTunes cards locally for shoppers to purchase at drastically reduced prices, gave out treats and goodies at the door to welcome shoppers, carried bags of groceries and gifts to vehicles and gave shoppers an overall warm and cheerful evening. This past week saw 120 of the 147 families invited to participate in the Christmas Store, take advantage of the great deals and wonderful atmosphere. Volunteers treated their customers to a personal shopper experience, helping them to pick out and purchase items with an average of 4 bags of groceries purchased per customer. Items purchased ranged from fresh fruit and dried goods to diapers, the latest toys and games, like Fifa 15, and ranged in price from $20-$35 for the total purchase per family. Volunteers also set up the store, arranging the products in an attractive manner, re-stocked shelves as purchases were made, drove customers to and from the Store, packed bags, and packed everything up at the end of the evening. A prayer centre was provided and Gary Simons and Tyaneil Darrell shared the Gospel with a rope trick. Many local businesses, such as Belco, Butterfield and Vallis, The Phoenix Stores, and Royal Imports, as well as other corporate and individual donors supported the Christmas Store with gift vouchers and donations that provided the raffle prizes and discounted items for purchase. The Christmas Store also made local purchases of items for the Store, supporting local businesses island-wide. All proceeds from the Store were donated to Cedarbridge Academy and The Berkeley Institute’s Breakfast Programs, providing students with a healthy breakfast every school day. 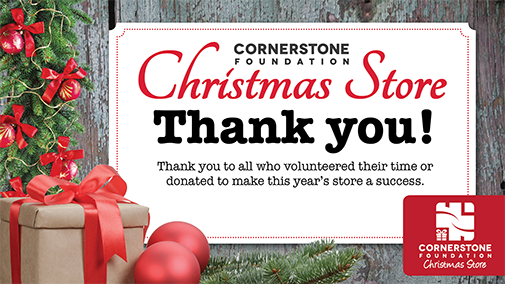 The Cornerstone Foundation would like to thank all volunteers and sponsors for making this Christmas Store the best one yet. The Cornerstone Foundation would also like to thank West Hamilton Limited for the donation of space free of charge to house the Christmas Store this year. Great Job and thank you for such kindness and Love as thats the only thing that will save us all! Merry Christmas! Thank you CornerStone. I didn’t attend but it sounds like it was wonderful experience for both the workers and the people who attended. God Bless.